Ever wondered whether a killer whale is a fixed asset for French tax purposes? Our team in Paris has the answer, and it's yes. But tax advice is just one of many services we provide. Home to some of the leading names in the French legal market, our 50-strong Paris team (including 13 partners) offers a partner-led service tailored to your organisation and its commercial imperatives. We work alongside French and international clients, including companies, banks, investment funds, property companies, mezzanine lenders and private clients. Everything you need from a law firm is available in one place. With a bilingual team at your service, you'll be working with lawyers who speak your language. Whatever the issue, you'll receive clear, practical advice that meets your commercial needs. You'll also benefit from our innovative approach, which means finding solutions where others see only problems. In Paris, our team broke new ground in real estate with two significant 'firsts.' It carried out the first transfer of assets with a value of €1 billion to dedicated collective real estate investment funds (OPCI). Our experts were also the first to transform an existing structure into an open-ended investment company (SPPICAV). Get off at the station Opéra (metro line No. 3, 7 or 8) and take the exit Place de l'Opéra. You can also take the RER A and get off at the station Auber and take the exit Place de l'Opéra. 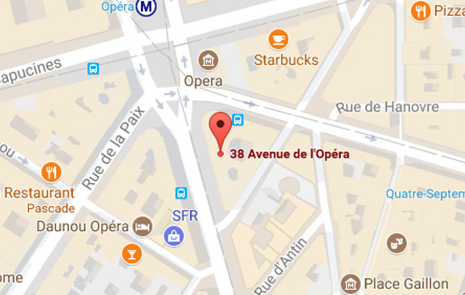 Several bus lines will take you to the Opéra bus stop: lines No. 22, 52, 53, 66. Public car parks exist nearby, e.g. Vinci Park Services situated 20, boulevard des Capucines. There is a regular Air France bus service between the airport and the place Charles de Gaulle-Etoile, then take the RER A and get off at the station Auber and take the exit Place de l'Opéra. There is a regular Roissybus service between the airport and the Place de l'Opéra. It takes approximatively 60 minutes to get our offices if traffic is good (much longer during rush hours). It also possible to take RER B to the Châtelet station followed by the RER A to the Auber station. Taxis are also available at the airport.